A planet (from Ancient Greek ἀστὴρ πλανήτης (astēr planētēs), meaning “wandering star”) is an astronomical objectorbiting a star or stellar remnant that is massive enough to be rounded by its own gravity, is not massive enough to causethermonuclear fusion, and has cleared its neighbouring region of planetesimals. The term planet is ancient, with ties to history, science, mythology, and religion. The planets were originally seen by many early cultures as divine, or as emissaries of deities. As scientific knowledge advanced, human perception of the planets changed, incorporating a number of disparate objects. In 2006, the International Astronomical Union (IAU) officially adopted a resolution defining planetswithin the Solar System. This definition has been both praised and criticized and remains disputed by some scientists because it excludes many objects of planetary mass based on where or what they orbit. Although eight of the planetary bodies discovered before 1950 remain “planets” under the modern definition, some celestial bodies, such as Ceres, Pallas,Juno, Vesta (each an object in the Solar asteroid belt), and Pluto (the first-discovered trans-Neptunian object), that were once considered planets by the scientific community are no longer viewed as such. The planets were thought by Ptolemy to orbit the Earth in deferent and epicycle motions. Although the idea that theplanets orbited the Sun had been suggested many times, it was not until the 17th century that this view was supported by evidence from the first telescopic astronomical observations, performed by Galileo Galilei. By careful analysis of the observation data, Johannes Kepler found the planets’ orbits were not circular but elliptical. As observational tools improved,astronomers saw that, like Earth, the planets rotated around tilted axes, and some shared such features as ice caps andseasons. Since the dawn of the Space Age, close observation by space probes has found that Earth and the other planets share characteristics such as volcanism, hurricanes, tectonics, and even hydrology. Planets are generally divided into two main types: large, low-density gas giants and smaller, rocky terrestrials. Under IAU definitions, there are eight planets in the Solar System. In order of increasing distance from the Sun, they are the four terrestrials, Mercury, Venus, Earth, and Mars, then the four gas giants, Jupiter, Saturn, Uranus, and Neptune. 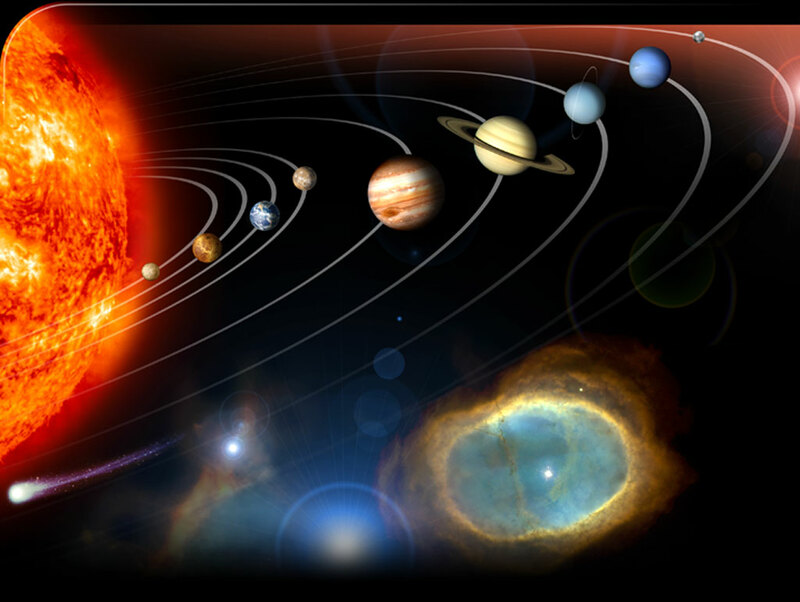 Six of the planets are orbited by one or more natural satellites. Additionally, although not planets, the IAU accepts five dwarf planets, with many others under consideration, and hundreds of thousands of small Solar System bodies. More than a thousand planets around other stars (“extrasolar planets” or “exoplanets”) in the Milky Way have been discovered. As of 20 December 2013, 1056 known extrasolar planets (in 802 planetary systems and 175 multiple planetary systems) are listed in the Extrasolar Planets Encyclopaedia, ranging in size from that of terrestrial planets similar to Earth to that of gas giants larger than Jupiter. On December 20, 2011, the Kepler Space Telescope team reported the discovery of the first Earth-sized extrasolar planets, Kepler-20e and Kepler-20f, orbiting a Sun-like star, Kepler-20. A 2012 study, analyzing gravitational microlensing data, estimates an average of at least 1.6 bound planets for every star in the Milky Way. Around 1 in 5 Sun-like stars have an “Earth-sized” planet in the habitable zone.